The anomaly robbed the LCROSS Flight Team of precious time to prepare for Impact. But with a healthy spacecraft, and enough propellant to do the job, our team was all too happy to prepare for the future. Ahead of us were five more Trajectory Correction Maneuvers (TCM 6 – 10) to precisely refine our crater targeting, then Separation, Centaur Observation, Braking Burn, and finally, Impact. In the midst of our TCM series, the Science Team continued refining their selection our target – the specific crater, and the point within the crater – based on the latest data from other missions. As a final confirmation of the payload instruments, the Science Team also wanted to look at Earth one last time before Impact. On top of all that, we needed to practice those final two critical days as much as we could. Out of Emergency Status, we resumed operations gradually, monitoring spacecraft health and performing typical housekeeping duties. 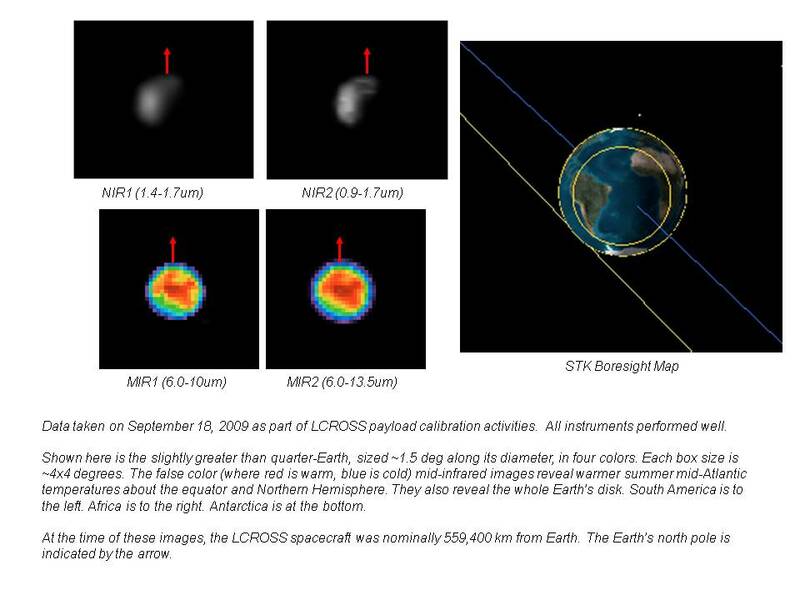 Of special note, as a result of the anomaly and our very small propellant margin, we decided to substitute Earth Look Cal 2, originally scheduled for DOY 250 (September 7), with a new, more propellant-efficient calibration maneuver that we termed “Earth Gaze”, on DOY 261 (September 18; see below). We received more good news about our trajectory. Despite the long train of thruster pulses that resulted from our anomaly, LCROSS’s orbit was still right on target. The Mission Design Team and Navigation Team agreed that TCM 6 would be too small to be worthwhile. This meant one less event to attend to in our busy schedule, and one less reason to take risks at this late, sensitive stage in the mission. This decision worked in our favor for saving propellant too. Each TCM typically requires the spacecraft to reorient to a specific direction so that LCROSS can add velocity in a particular direction via the 22 N Delta-V thrusters, and then back again to the Cruise attitude. All of our remaining “burns” were expected to be small; so much so that the propellant devoted to the reorientation maneuvers was expected to be several times more than for the burn itself. Waiving TCM 6 meant we could save more propellant, and reduce risk. Throughout the mission, Omni Pitch maneuvers have been necessary to keep our primary antenna pointed towards Earth. In all previous Omni Pitch renditions, the “slew” was performed in SIM DB2 (Stellar Inertial Mode, deadband 2), an Attitude Control System mode that enables relatively efficient attitude changes. However, SIM DB2 significantly accelerates the spacecraft rotation to induce the change in orientation, and this costs propellant. In our bid to save propellant, we re-examined all of our previous maneuver approaches for opportunities to be more efficient, including for Omni Pitch maneuvers. Someone on the Flight Team came up with the idea of providing LCROSS a long sequence of small attitude changes rather than one big one, with the goal of avoiding the accelerations of SIM DB2 (small attitude changes don’t justify large rotational accelerations, and therefore are cheaper propellant-wise). Simulations of this new approach, what we informally called “Quaternion Creep”, indicated this would lead to a significant propellant savings, so we baselined this approach for our Omni Pitch maneuver on DOY 253. Normal Omni Pitch maneuvers used to take 40+ minutes to execute. This new approach took 4 hours 20 minutes, but saved a lot of propellant. Well worth the bargain. Cosmic rays are high-energy photons that are known to interfere with spacecraft computers by in effect reprogramming single bits of memory as they pass through. When a bit in computer memory is reprogrammed by radiation, but not permanently damaged, it is called a Single-Event Upset (SEU). Most spacecraft computers and onboard memory chips are “radiation-hardened” to prevent or otherwise sidestep the effects of cosmic rays. The spacecraft Data Handling Unit (DHU) is the independent computer that controls the operation of the science instrument payload. Command sequences onboard the DHU control all of the sampling sequences and instrument settings to make sure LCROSS collects the best possible set of data at impact, and for other calibration events. They are clearly very important to the success of LCROSS. The DHU, and those instrument command sequences specifically, are somewhat vulnerable to SEU, and the Payload Team had not checked the contents of the DHU in a long time. On this day, our team dumped (downloaded) the full contents of DHU non-volatile memory and confirmed that the sequences were still intact. It was hard to find time in our busy operational schedule to practice all of our pre-Impact procedures. In the months before launch, we spent all of our time readying for Transfer Phase and the first parts of Cruise Phase. Impact seemed so far away. Then Cruise Phase, with the anomaly, was far busier than expected. With only weeks remaining, our perspective was entirely different. We took full advantage of two free days in our schedule to hold the “Last Two Days Rehearsal”, a full-team, high-fidelity rehearsal of the last two days of the mission, similar in style to our First Week Rehearsal (see the post on “First Week Rehearsal”). For 42 hours, following the exact schedule we planned to follow in flight, and synchronized with the actual times of day when events would occur, the Flight Team practiced nearly every aspect of those operations. We ran 24 hours a day, with three overlapping execution shifts (Shift B, then A, then B again), and two planning sessions. In the rehearsal, the team successfully hit the target crater and collected all of the science data. However, the there were some procedural and process shortcomings that made things just a bit rocky at times. We learned a lot, and began working improvements in the days after the test. In substitution for Earth Look Cal 2, we conceived of a more propellant-efficient calibration event we coined, for lack of something more official, “Earth Gaze Cal”. We loaded the commands for this event on DOY 260 (September 17), and executed the calibration the following day. Rather than sweep back and forth over the Earth (see the full description of our first Earth Look in “During Our Second Trip Around Earth”), Earth Gaze looked straight at the Earth for an extended period, during which time we collected camera and spectrometer data. This was the Science Team’s last chance to evaluate instrument performance and settings before Impact. We captured some more images. Here are a few, along with a simulation to show the orientation of Earth during the event. Despite previous efforts to rid the Centaur outer skin of water on Cold Side Bakeout #1 and #2, our Navigation team continued to observe the accelerating effects of escaping water at the end of the second of those events. With the amounts of water remaining, the Science Team was no longer concerned that this water could interfere with water measurements at Impact – there was just too little left. However, Navigation was still concerned that remaining water might push our Centaur off course in the hours before Impact, after Separation when we no longer had any control over its orbit. Recall that we had planned to execute Cold Side Bakeout #3 on DOY 234 (August 22), but our plans were thwarted by the discovery of the anomaly. Cold Side Bakeout #3 was unfinished business that had to be completed. In an unrelated thread, we also wanted to test the antenna we’d be using for Impact. LCROSS has two Medium Gain Antennas (MGA’s), one on the +Z axis, the other on the –Z axis, used to downlink high-speed science data to Earth. We had used the +Z MGA during Lunar Swingby, but had never tested the –Z MGA in flight. We didn’t want to discover a problem with this antenna in the hours before impact, so we devised a test that would expose any issues immediately, and that would couple very nicely with Cold Side Bakeout #3. The combined Cold Side Bakeout #3 and –Z MGA Test took advantage of the fact that LCROSS was passing right through the ecliptic plane, the plane of the Earth’s orbit around the sun. The LCROSS +X axis was perpendicular to the ecliptic plane at the time, and so by rotating about the +X (roll) axis, we could simultaneously face the “cold side” of the Centaur towards the sun, and the –Z MGA towards the Earth (required to test communications via this antenna). It was a perfectly-timed opportunity. On DOY 267 (September 24), we performed the maneuver. Unlike previous versions of Cold Side Bakeout, we stopped the spacecraft twice, once at 135 degrees rotation, and again at 225 degrees. The first position pointed the –Z MGA (which is canted by 45 degrees) straight at the Earth, and warmed one side of the cold skin of the Centaur. After 20 minutes, LCROSS rotated another 90 degrees, moving the MGA off the Earth, and moving another part of the cold face of the Centaur into full sunlight. We characterized one “slice” of the –Z MGA antenna gain pattern, confirmed that it was operational and mounted according to specification, and removed more water from our impactor. One of the risks of Cold Side Bakeouts is that we might induce a thermal instability in our thrusters, as we had in Cold Side Bakeout #1, prompting our improvised fault management to fire the thrusters to keep them warm (see the post entitled “Our First Orbit Around the Earth” for details). Happily, our thrusters remained thermally stable, and we avoided any additional propellant cost. LCROSS had not performed a Trajectory Correction Maneuver since TCM 5a, way back on July 21. We’d been literally coasting along our orbit since then. By this time, the Science Team had selected a satellite of the Cabeus crater, Cabeus A1, as our impact target. Trajectory Correction Maneuver 7 (TCM 7) was performed on September 25 to target that location on Impact Day. According to predictions on burn pointing errors, TCM 7 would guarantee a hit within 38 km of our intended target. Future burns would reduce the error a lot further. Still 14 days from Impact, TCM 7 nudged LCROSS by 32 cm/s (just over 1 foot/sec), but enough to make a big difference in impact position. Following TCM 7, the Science Team continued to receive data from other lunar missions. Lunar Reconnaissance Orbiter (LRO), our partner at liftoff, devoted much of its operational time to scouring our top target regions, and data from Chandrayaan-1 and other missions continued to improve our knowledge of the mapping of possible water concentrations at the lunar south pole. New information gathered after TCM 7 prompted the Science Team to redirect LCROSS to the main Cabeus crater. Relatively close to the previous target, changing represented a small amount of extra propellant, but a potentially significant improvement in science data. TCM 8 was performed on September 30, and changed LCROSS’s velocity by 35 cm/s. Not only did TCM 8 target the new impact position, but it also refined our impact timing. Our narrow target time window will allow the Hubble Space Telescope to take images of our impact plume. Our Last Two Days Rehearsal on DOY 258-259 did not emphasize off-nominal events, but rather the full integration of the team in a single push. On October 1, Shift B, who will be overseeing Impact, practiced two complete run-throughs of the final two hours of the mission. I helped our Test Conductor in setting up the tests, and planning a series of anomalies that would really challenge Shift B. During the simulations, we failed banks of temperature sensors and heater circuits, caused various instruments to malfunction and the DHU to crash. We faulted the IRU, forcing a recovery in the midst of early pre-Impact science operations. We failed the –Z MGA switch (even though this is far less likely having conducted our MGA test), and forced the team to perform the Impact sequence at a contingency low data rate. Their team did very well, and succeeded in meeting mission objectives on both runs. The members of Shift B were very happy they had that final opportunity to practice. The flight planning team has one of the biggest challenges in the final 24 hours before Impact. 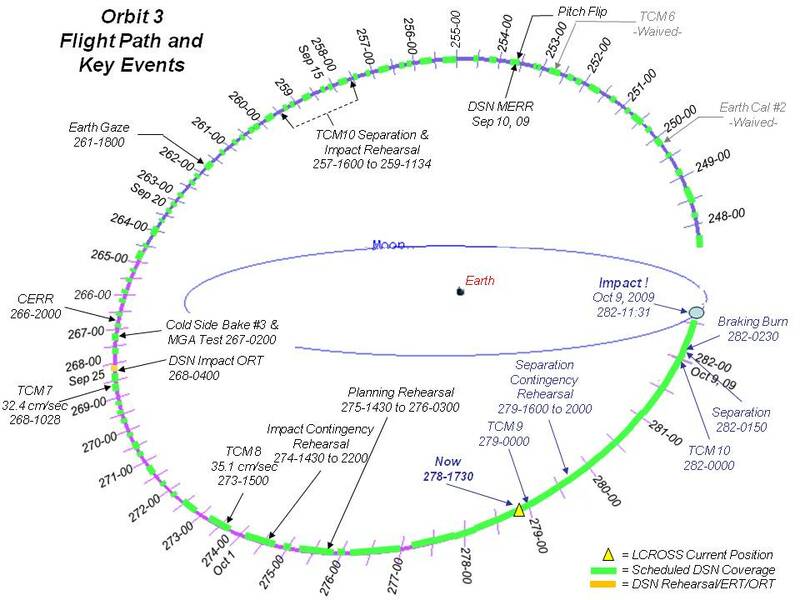 Based on a final assessment of the LCROSS orbit, they have to plan the final series of maneuvers that culminate in the Impact event: TCM 10, Separation, Centaur Observation, Braking Burn, and Impact itself. From the maneuver plan, the team must generate command sequences for each of these events, and then run them on our simulator to prove that they are flight-worthy. Furthermore, they also need to generate and test command products to handle specific contingency events, like a failed Separation, or a late Braking Burn. They even generate a preliminary Impact command sequence, just in case we lose contact with LCROSS for hours before the event. Some of these products can be produced well in advance, but a great number of them depend on the final orbit assessment, and the specific orientations that are required for TCM 10, Separation and Braking Burn to ensure we accurately hit our target. The Last Two Days Rehearsal proved that the planning team could generate all of its products, but could not quite perform its full list of quality assurance tasks in time. Following the rehearsal, the team took some significant steps to streamline the planning, command generation and quality assurance process. We found opportunities for working in parallel, for skipping unnecessary steps, for nailing down some variables in advance to reduce the amount of variance on Impact Day. To test these changes, we conducted a Planning Rehearsal for DOY 275 (October 2) to span the full 12 hours of the process, exactly as it will happen on the Impact Day. I was really happy with the results. The team actually finished most of its tasks early, including simulations of all command products, and their delivered products contained no errors. The Command Approval Meeting, our last visual evaluation of commands, finished early. I was very encouraged by these results, and the planning team is now fully confident that they could repeat this level of performance on Impact Day. The remainder of this post has to do with current and future events. I’m finally caught up! This morning, as I write this post, Shift B is loading its final set of science payload command sequences to the spacecraft. The Science and Payload Teams have pored over the data we collected from all previous science calibrations to derive a set of camera exposure/gain settings for Impact. Over-exposure means washed-out images, which under-exposure means less contrast and detail. Six of nine sequences will be changed to reflect the Science Team’s best knowledge of camera performance, and expected conditions on our final descent to the lunar surface. Later this afternoon, Shift A will be performing TCM 9, our second-to-last, and possibly our last orbit adjustment. After TCM 8, based on the latest lunar mapping data, the Science Team selected a different spot within the Cabeus crater. This is our final target. With only 7.6 seconds of firing, TCM 9 moves our impact point from our old point in Cabeus to this new location roughly 9 km away. TCM 9 should put us within 1.75 km of our target. If we can “nail” this maneuver by staying within that range, we’ll be able to skip TCM 10. TCM 9 is our last spacecraft activity, other than monitoring and housekeeping, until our final rapid-paced series of maneuvers in the final 24 hours. As you can imagine, things are starting to get very busy! I will submit one more post with a detailed description of the final 24 hours. I also have a few guest authors who would like to share some things with all of you before Impact. Stay tuned…this is going to be an incredible week. Thanks for this – it’s been good to have your updates. The Twitter news is a greatw ay to keep people up to date as well. Is the new location after TCM 9 shown on a picture or map anywhere? As a ‘site guy’ I’m always looking for maps! I looking foward to impact day. We have good knowledge of our history of impact points, but the texture map showing the crater locations is outdated. Our targets reflect very recent updates to the precise positions of the craters at the south pole. Therefore, we won’t be releasing a map until the texture map matches our current knowledge of the moon. If I am to understand CORRECTLY, you plan to literally send a missle to blow up a creator in the south pole of the moon to see if there is water? Are you kidding .This is seriously not a wise decision. This is being done without regard for the people of earth or their safety or well being, .No one knows what catastrophic impacts it can have to the moon , earth or other life we know nothing about. This is not a game.We are lucky to have left of what paradise ,the creator has blessed us with.This is not a movie. Leave the moon alone please. So breathtaking to once again see finest human intelligence so misguided. The question is the paradigm which allows for such disrespect of nature and the mysteries of creation as to not think twice about detonating an a- bomb on the surface of the moon. It’s not about anything else but that. It’s not your fault really. But really, no one ever thinks of it? run cold let me tell you. There has been some irresponsible reporting from the media in the last couple of days claiming that NASA is sending a “bomb” and a “missile” to the moon. I wanted to set some things straight here. To be perfectly clear, neither LCROSS nor any of its components are a “bomb”. There are absolutely no explosives onboard. The Centaur impactor is a completely inert shell of a rocket, empty of propellant, that pushed us out of Earth’s orbit on June 18. It’s that simple. To use the word “missile” for LCROSS invokes images of weapons. LCROSS is categorically NOT a weapon. Those of us in the space exploration business seek the peaceful exploration of the solar system and the universe, and are driven by discovery. The LCROSS mission is simply one of the most efficient ways to gain access to the surface of a south pole crater, where we think water is most likely to exist. Landing on the surface is far more complicated and expensive. If you can’t land, and the details of water distribution and amount cannot be ascertained from orbit, the only way to find out is to raise the material and to see what it’s made of. It is disheartening that LCROSS is being mis-represented in the media, but I hope I can express our true purpose and dispel the mythology that some choose to propagate.